Starting to look for a new craft or hobbie to enjoy isn't as easy as it seems. There are endless choices out there, and this incredible book will help you make decisions about which craft you'd like to try. For me, I instantly "needed" a die-cut machine and a sticker/lamination machine the moment I saw them on pages 9 and 10. I love gadgets but lack creativity yet I was able to discover many craft projects that would work for me. As for many people, time is the one thing I don't have enough of. Making and sending greeting cards shows you care enough to go to the trouble of creating something very personal. 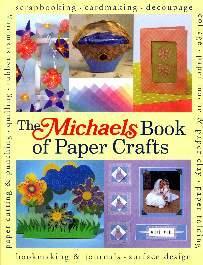 Whether it's scrapbooking, making cards or journals, decoupage, paper folding (origami), paper mache, or quilling you're into, you'll find many great and inspiring ideas in this fully illustrated book. There are also many templates to choose from. Creations I loved are the Personalized Cards (pgs 54/55), the Christmas Tree Card (pgs 62/63), Beachcomber Candles (would make great personalized gifts - pgs 116/117), Decoupage Eggs (top left on pg 129), and the Trays (pgs 179-181). Use your printer to print some wonderful patterns off the Internet but with so many beautiful kinds of paper (just look through the daily junk mail and collect interesting textures to use) on the market, projects are endless. If you've never been to a Michaels store, do yourself a favor. But, give yourself time as you're going to need it. Conclusion - Wonderfully creative. You can involve the children too.